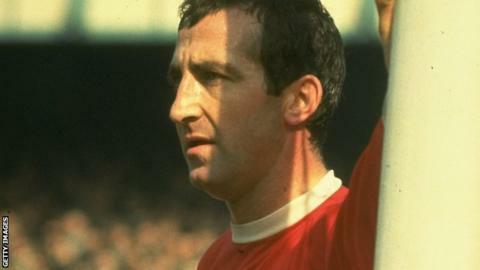 Former Liverpool and England defender Gerry Byrne, a member of the 1966 World Cup-winning squad, has died aged 77. Liverpool announced the passing of their former left-back, who made 333 appearances for the club. He played in the 1965 FA Cup final win over Leeds United when he broke his collarbone three minutes into the game and crossed for the Reds' first goal. Byrne was also part of Liverpool's League Championship-winning sides in 1963-64 and 1965-66. In 2009, Byrne and his fellow non-playing squad members from the 1966 World Cup were presented with winners' medals in a Downing Street ceremony, following a change in policy by world governing body Fifa. Byrne made his Liverpool debut in September 1957 after coming through the club's ranks and his final Reds outing was in 1969. "The Liverpool-born defender was a model of consistency at left-back under Bill Shankly and a testament to his popularity was evident as 40,000 supporters were at Anfield for his testimonial in April 1970," Liverpool said in a statement.